At 02.00 LT on Oct 10th 2006 the moon was just two days after full high in the east within the stars of Taurus. High level virga wispy type clouds arrived on the scene and covered the moon. These types of clouds are packed with falling ice crystals which should produce a lunar atmospheric show. - it did. 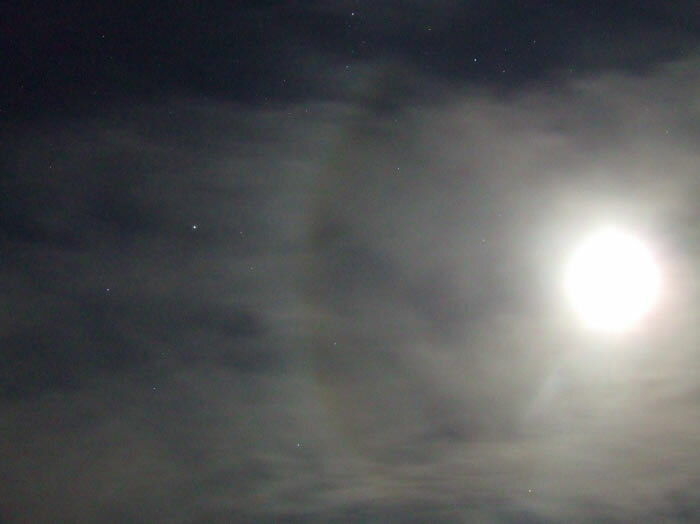 The eastern section of a 22 degree moon halo suddenly appeared and although it was colourless the camera did pick up the red and blue tones which evaded my eye. The halo can be seen curving through the constellations of Perseus and Auriga. A very nice sight.